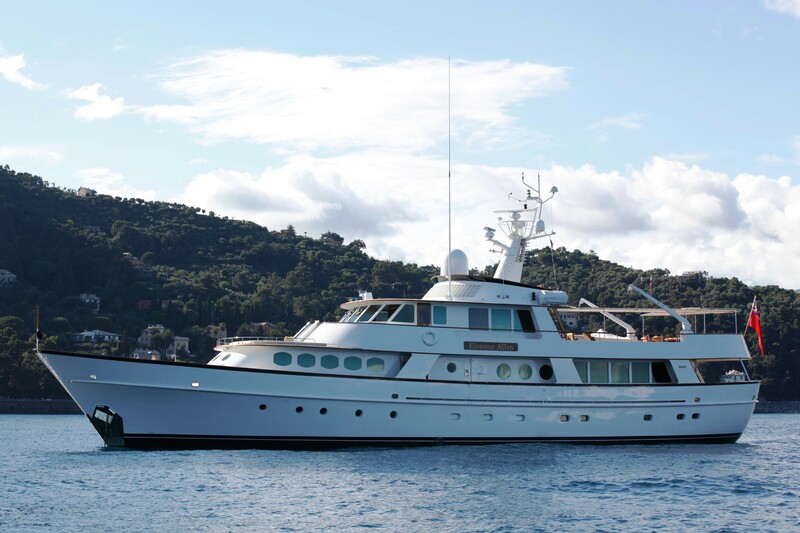 Classic motor yacht C-SIDE (ex ELEANOR ALLEN) was designed by Diana Yacht design and built by Feadship De Vries in 1979. The 34.4m (112.10ft) yacht C-SIDE, underwent an extensive refit in 2010 and receives regular upgrades, ensuring optimum luxury, style and comfort. 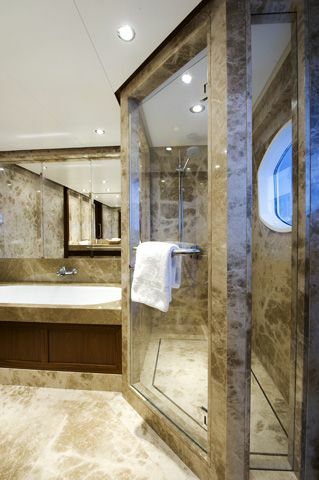 Accommodation aboard the yacht is in 4 en-suite cabins, for up to 8 guests. 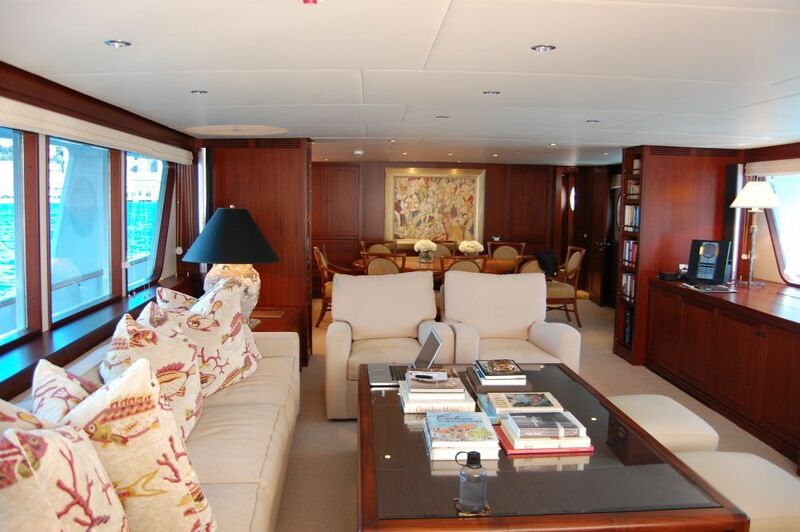 M/Y C-SIDE features a timeless contemporary interior décor, designed by Michael Kirschstein. The neutral carpets and headlining emphasize the rich wood panels and joinery, while stylish soft furnishings offer an elegant yet relaxed ambiance. The salon is an open plan, with a generous lounge aft, boasting ample plush seating and coffee table. Forward, the formal dining table seats 8 guests easily. The lounge is surrounded by panoramic windows, while the formal dining area has large round ports, creating an intimate atmosphere. 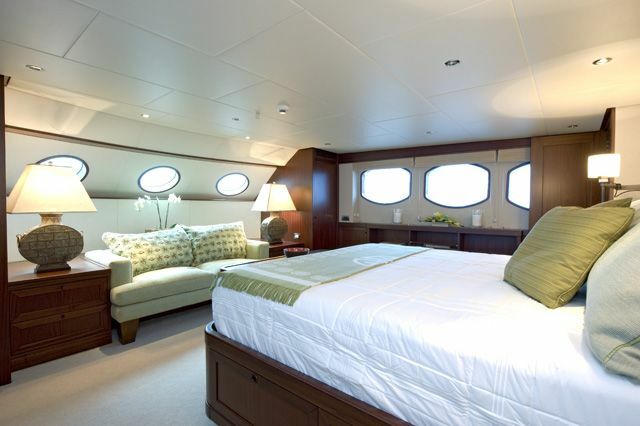 Plenty of natural light is found throughout the yacht’s interior, from the social spaces to the private guest cabins. An upper skylounge boasts further relaxing and an office, with fabulous views from further panoramic windows. 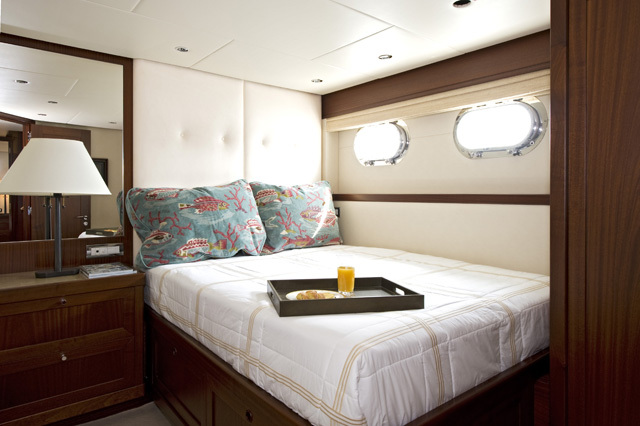 Aboard the Feadship C-SIDE, guests may enjoy ample exterior living on 3 teak decks. 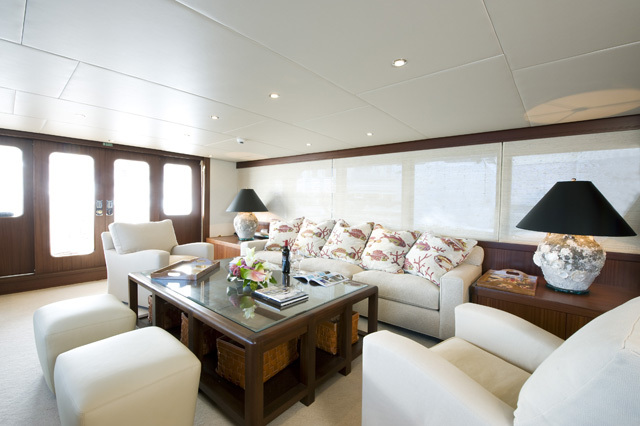 On the main deck, aft of the salon is a shaded area, with seating, a perfect extension for entertaining from the salon and dining. The skylounge flows out onto a large upper deck, complete with chaises, an alfresco dining option and full beam aft seating. A fitted Bimini cover ensures comfort from the sun, while forward of the upper deck, is a massive sunpad for the sun worshipers. A further sunning area is on the top deck, offering optimum privacy, with wrap around solid rails. Powered by 2 CAT x 520hp engines the C-SIDE motor yacht cruises at 10 knots, with top speeds of 13 knots. She is an economical yacht, with long range capabilities. 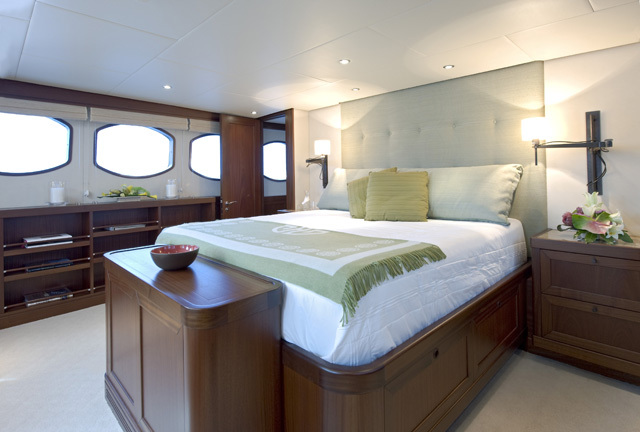 Fitted with anti-roll stabilizers, M/Y C-SIDE offers comfortable cruising. 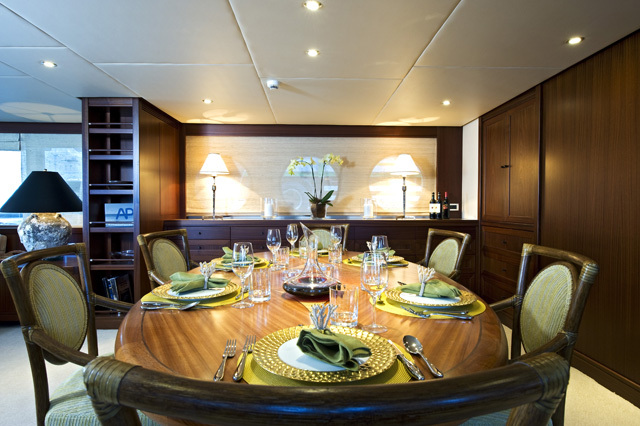 Luxury motor yacht C-SIDE can accommodate up to 8 guests, in 4 en-suite cabins. 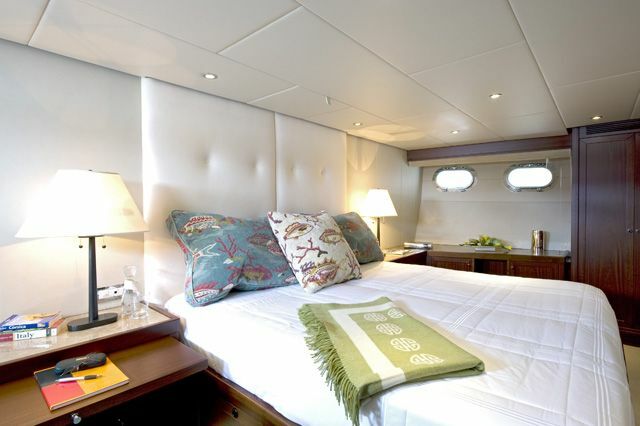 The master stateroom is on the main deck, forward of the salon and dining, with a full beam layout, king size bed, sofa, vanity and marble en-suite with his and hers sinks, large shower and deluxe tub. 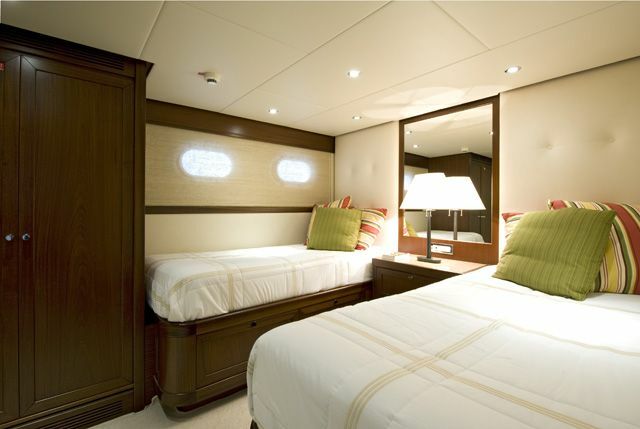 The VIP cabin is below decks and aft of the yacht, with a full beam layout and center lined king size bed. A guest cabin has a queen size bed, while a further guest cabin offers 2 side by side twin beds. 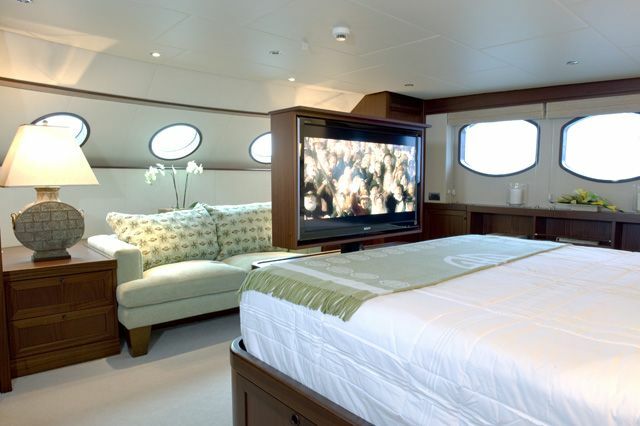 All 4 cabins have TV/DVD entertainment and feature a light and airy ambiance. Yacht C-SIDE (ex ELEANOR ALLEN) has range of extras and amenities onboard including the following Tenders & Toys: A 15' Sailing Dinghy Clinker build, a 15' Novurania with Yamaha 90 hp (crew tender), Waterskis, Life jackets for water sports and Snorkelling equipment. Communications include GSM Satellite communications, Satellite Phone - Fax – Internet there is WIFI on board. Audio Visual Equipment and Deck Facilities include a Seatel Sat Antenna, B and O Music system all over the yacht with 16000 songs pre recorded, LCD TV (Master cabin), Pioneer DVD set and Apple TV (Master cabin), LCD TV (Main saloon), Pioneer DVD set and Apple TV (Main saloon), Over Two hundred videos, Sony flat screen and DVD (in all Guest cabins), WIFI on board.